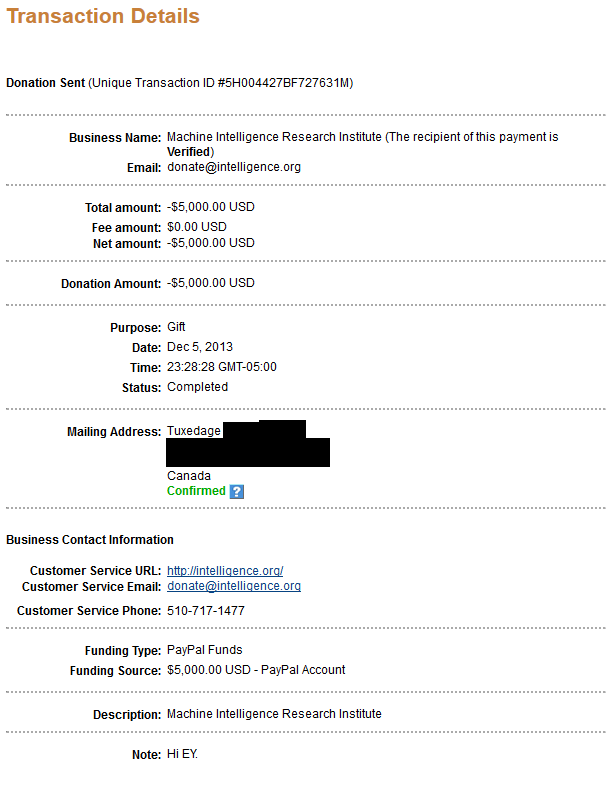 Thanks to Peter Thiel, every donation made to MIRI between now and January 15th, 2014 will be matched dollar-for-dollar! Also, gifts from "new large donors" will be matched 3x! That is, if you've given less than $5k to SIAI/MIRI ever, and you now give or pledge $5k or more, Thiel will donate $3 for every dollar you give or pledge. If you prefer to give monthly, no problem! If you pledge 6 months of monthly donations, your full 6-month pledge will be the donation amount to be matched. So if you give monthly, you can get 3:1 matching for only $834/mo (or $417/mo if you get matching from your employer). We accept Bitcoin (BTC) and Ripple (XRP), both of which have recently jumped in value. If the market value of your Bitcoin or Ripple is $5k or more on the day you make the donation, this will count for matching. If your employer matches your donations at 1:1 (check here), then you can take advantage of Thiel's 3:1 matching by giving as little as $2,500 (because it's $5k after corporate matching). Please email malo@intelligence.org if you intend on leveraging corporate matching or would like to pledge 6 months of monthly donations, so that we can properly account for your contributions towards the fundraiser. Now is your chance to double or quadruple your impact in funding our research program. Held three research workshops, including our first European workshop. Talks at MIT and Harvard, by Eliezer Yudkowsky and Paul Christiano. New papers: (1) Algorithmic Progress in Six Domains; (2) Embryo Selection for Cognitive Enhancement; (3) Racing to the Precipice; (4) Predicting AGI: What can we say when we know so little? New ebook: The Hanson-Yudkowsky AI-Foom Debate. New analyses: (1) From Philosophy to Math to Engineering; (2) How well will policy-makers handle AGI? (3) How effectively can we plan for future decades? (4) Transparency in Safety-Critical Systems; (5) Mathematical Proofs Improve But Don’t Guarantee Security, Safety, and Friendliness; (6) What is AGI? (7) AI Risk and the Security Mindset; (8) Richard Posner on AI Dangers; (9) Russell and Norvig on Friendly AI. New expert interviews: Greg Morrisett (Harvard), Robin Hanson (GMU), Paul Rosenbloom (USC), Stephen Hsu (MSU), Markus Schmidt (Biofaction), Laurent Orseau (AgroParisTech), Holden Karnofsky (GiveWell), Bas Steunebrink (IDSIA), Hadi Esmaeilzadeh (GIT), Nick Beckstead (Oxford), Benja Fallenstein (Bristol), Roman Yampolskiy (U Louisville), Ben Goertzel (Novamente), and James Miller (Smith College). How Will Marginal Funds Be Used? Hiring Friendly AI researchers, identified through our workshops, as they become available for full-time work at MIRI. Running more workshops (next one begins Dec. 14th), to make concrete Friendly AI research progress, to introduce new researchers to open problems in Friendly AI, and to identify candidates for MIRI to hire. Describing more open problems in Friendly AI. Our current strategy is for Yudkowsky to explain them as quickly as possible via Facebook discussion, followed by more structured explanations written by others in collaboration with Yudkowsky. Improving humanity's strategic understanding of what to do about superintelligence. In the coming months this will include (1) additional interviews and analyses on our blog, (2) a reader's guide for Nick Bostrom's forthcoming Superintelligence book, and (3) an introductory ebook currently titled Smarter Than Us. Other projects are still being surveyed for likely cost and impact. We appreciate your support for our work! Donate now, and seize a better than usual chance to move our work forward. If you have questions about donating, please contact Louie Helm at (510) 717-1477 or louie@intelligence.org. Screenshot Service provided by LinkPeek.com. In general, I'm much happier with MIRI/SIAI as an organization now than I've ever been in the past. I'm highly supportive of more public facing research and more engagement with the academic community. The workshops appear to be producing fantastic results, like the probabilistic logic paper, and I'm hoping to see more things like that. In light of the unusual 3x offer, I have borrowed from future-Yvain's expected contributions to MIRI and donated $5000. It should qualify for matching. This extremely generous matching offer came at a fortuitous time for me, since I just succeeded at my master plan of becoming an effective altruist in Silicon Valley and doing earn-to-give for MIRI. $10,000 from me as well. With full respect intended, are you insane trying to pull an "earn to give" plan in Silicon Valley? Move somewhere cheaper if you're not independently wealthy! They would spend less, but presumably also earn less, and it's the arithmetic difference (rather than the ratio) that matters. That depends. There are ways to work high-salary jobs in low-cost-of-living areas if you're willing to deliberately seek them out. I know when I worked remote for a few months a year and a half ago, my after-housing income on a theoretical annualized salary of $66k/year was larger (arithmetically) than my previous $80k salary minus Bostonian housing expenses. If you're really trying to pour money into a charitable effort rather than a landlord's coffers, I would suggest running the numbers and seeing what you can do. There are ways to work high-salary jobs in low-cost-of-living areas if you're willing to deliberately seek them out. That's not true in a more than trivial sense. Nobody literally means that the low-cost-of-living area has no high-salary jobs; what they mean is that the distribution of jobs in that area is more weighted against the high--salary jobs. There will always be individual high-salary jobs in that area--but there will be fewer of them. The reason that you can only get those jobs if you spend a lot of effort finding them out is that since there are fewer such jobs, the easy-to-find ones have all been taken already. Pointing out "I found one" doesn't generalize. There aren't enough for everyone to find one, and if everyone did try to find one, they'd end up having to make even more effort than you (since you probably took one of the hard to find but not hardest to find ones), and the next even more, up to the point where there just won't be any left at any difficulty level. That's a very good point; I should give a more specific recommendation. I've found that the monthly Hacker News job postings often contain a fairly decent number of companies offering to pay high salaries for remote work. It's not going to give you the Bay Area lifestyle if you work outside that area via internet, of course, but if your actual intention is to live frugally so you can donate to charityworld optimization efforts, you were probably avoiding the Bay Area Lifestyle anyway. I require a lower standard of living than most people with middle class incomes, so I don't anticipate a problem in making my donation goals. Paid 300$ with my employer matching it, but the employers contribution may come in only at around Jan 15. Hope that isn't too late. No, that'll count just fine. Thanks! ... or even octuple with employer matching ($2.5k -> $20k). Probably more than 10x when accounting for tax deductions for US residents. That is, the tax deductions work for US residents only. The rest works from anywhere. I have donated $5,000 for the MIRI 2013 Winter Fundraiser. Since I'm a "new large donor", this donation will be matched 3:1, netting a cool $20,000 for MIRI. I have decided to post this because of "Why our Kind Cannot Cooperate". I have been convinced that people donating should publicly brag about it to attract other donors, instead of remaining silent about their donation which leads to a false impression of the amount of support MIRI has. On the other hand, MIRI hit its goal three weeks early, so the amount of support is pretty obvious. I donated $700 to CFAR. I don't see a corresponding thread for CFAR's donation drive (which frankly seems like an strange omission -- LessWrong is a good donor base for them, no? ), so let me note here that I've just donated $1000 to CFAR. I usually donate just to MIRI, but since MIRI's matching total has now been reached, and given comments by Yudkowsky and Muelhauser in Facebook, I shift this winter's donation to CFAR instead. The donation bar tweak was Malo. Cheers, and thanks for your donation to CFAR! 0.1 BTC. Had some left over in a hot wallet, and I have a vague recollection of precommitting to donate around 50 bucks if MIRI impressed me with their attempts to improve the productivity of their organization. What about CFAR this year? Should I consider donating to their 2013 Winter Matching Fundraiser instead of to MIRI? Last year I remember someone (Eliezer?) wrote a somewhat confusing recommendation as to which one one should donate to. A quick glance at their progress reveals that the MIRI one has almost reached its goal of $250k whereas CFAR has only gotten $8k so far (but also has another two weeks to go). MIRI's fundraiser has gone surprisingly well surprisingly quickly, so if you're happy to support either organization, then at this point it probably makes sense to give to CFAR's fundraiser. Awesome! I get my first paycheck (literally, the first paycheck I've earned in five years) on January 25, and giving CFAR $100 will give me more happiness than eating out once a week in February - especially since I fully intend to avail myself of one of CFAR's workshops at the earliest possible opportunity. I'd give more if I could, but right now I'm clawing myself back out of debt, and $100 is roughly the equilibrium point between "I really, really want CFAR to succeed so I can utilize it" and "I really, really want to stabilize my finances so I can afford to utilize CFAR". If it's the first paycheck you've earned in five years and you can't afford to eat out once a week without the donation, and you have a lot of debt, it's likely you have little or no savings. If so, I would suggest putting the $100 in the bank in preference to either eating out or CFAR. You never know when a $100 expense might come up. Furthermore, you should be paying off the debt anyway. Put it this way: Imagine that instead of you coming into possession of $100, someone were to shave $100 off your debt directly. Under those circumstances, would you go into $100 more debt (cancelling the effect of reducing it) to be able to give some money to CFAR? (Ignoring the fact that you probably can't borrow in increments of $100.) If you wouldn't increase your debt by 100 to pay CFAR in the first scenario, you shouldn't pay CFAR in preference to reducing your debt by $100 in this scenario. nod that's pretty reasonable, but my total living expenses are only 50% of my income, and I got a sign-on bonus. I'm basically planning on saving 50%, living off the other 50%, and then paying off debts from the savings as the savings passes a certain threshold (defined as 6 months of living expenses). Between the sign-on bonus and the "have fun so I don't fall back into depression and despair" part of living expenses (which is an ABSOLUTELY NECESSARY living expense and therefore already included in the non-saved 50%), $100 for a charity I believe in and intend on using myself later is absolutely in-budget. And as for the risk of going further into debt, my debt tends to be somewhat discretized (due to interest amortization, student loan regulation, etc.) so certain methods and frequencies of payment are more efficient than others. $100 from my sign-on bonus is practically a rounding error. but my total living expenses are only 50% of my income, and I got a sign-on bonus. That would tend to imply that you actually can afford to eat out once a week even with the donation. My point wasn't that there was a risk of going further into debt, it was that paying money to CFAR is equivalent to paying off the debt and then un-paying it so that you can donate to CFAR. If someone paid off your debt, would you un-pay it so that you could donate to CFAR? Well, if it's a stable income then there's nothing wrong with a little celebration. Could be worth it for the boost in self-esteem from being able to contribute to something one feels is genuinely good and special. Hmmm.... I donated earlier this year for the value of several Harry Potter books. Given my income, I think my charitable donations will probably go to GiveDirectly and Christmas gifts for friends this year. Also, Facebook, seriously? And here I was stuck looking at Luke's So You Want to Save the World page. One strategic point of my own: as your ideas are moving into the mainstream (someone reviewed Our Final Invention in the Washington Post editorial section a few days ago, taking the ideas very seriously and using the term "friendly AI" explicitly), it's time to move from "wanting to be a cult" to "wanting to be a large, thriving movement". If you want someone to write propaganda to this effect, call me ;-). Overall, though, your transition from SIAI to MIRI and your partnership with FHI have rendered you a far more professional organization who can do a better job being taken seriously. Good job on that. Facebook is only the first step. Part 1 of the second step has now been published. Since Eliezer's time is the bottleneck, we're trying to find a way to explain open problems clearly while using as little of Eliezer's time as possible for each one.